경주 송화산 동쪽 구릉 위에 자리잡고 있는 신라 장군 김유신의 무덤이다. 김유신(595∼673)은 삼국통일에 중심 역할을 한 사람으로, 김춘추(후에 태종무열왕)와 혈연관계를 맺으며 정치적 발판을 마련하였고, 여러 전투와 내란에서 큰 공을 세웠다. 660년에 귀족회의의 우두머리인 상대등이 되어 백제를 멸망시켰으며, 668년에는 신라군의 총사령관인 대총관(大摠管)이 되어 고구려를 멸망시키고 당의 침략을 막아 신라 삼국통일의 일등공신이 되었다. 무덤은 지름이 30m에 달하는 커다란 규모이며, 봉분은 둥근 모양이다. 봉분 아래에는 둘레돌을 배치하고 그 주위에는 돌난간을 둘렀는데, 둘레돌은 조각이 없는 것과 12지신상을 조각한 것을 교대로 배치하였다. 12지신상은 평복을 입고 무기를 들고 있는 모습으로 몸은 사람의 형체이고 머리는 동물 모양이다. 조각의 깊이는 얕지만 대단히 세련된 솜씨를 보여주고 있는데, 이처럼 무덤 주위의 둘레돌에 12지신상을 조각하는 것은 통일신라 이후에 보이는 무덤양식으로, 성덕왕릉으로부터 시작된 것으로 보고 있다. 『삼국유사』에 의하면 김유신이 죽자 흥덕왕(興德王)은 그를 흥무대왕(興武大王)으로 받들고, 왕릉의 예를 갖춰 무덤을 장식한 것으로 보인다. 또 『삼국사기』에는 김유신이 죽자 문무왕이 예를 갖추어 장례를 치르고 그의 공덕을 기리는 비를 세웠다고 전한다. 그러나 현재 그 비는 전하지 않고 조선시대에 경주부윤이 세운 '신라태대각간 김유신묘'의 비만 남아있다. Located at the eastern foot of Songhwasan Mountain, this is the tomb of General Kim Yu-sin, who made a significant contribution to the unification of the kingdoms of Baekje and Goguryeo under Silla. As a member of the order of Hwarang (Flower of Youth, an elite youth military corps), Kim Yu-sin (595-673) trained in martial arts. After he forged familial relations with Kim Chun-chu, later King Taejong Muyeol, his political influence began to grow. He led the military campaigns against Silla's rival kingdoms, Baekje and Goguryeo, scoring victories. He helped Kim Chun-chu ascend to the throne and assisted the king in unifying the three dynasties. After the unification of the Three Dynasties, he drove out the Tang forces and consequently unified all of the Korean Peninsula for the first time in its history. 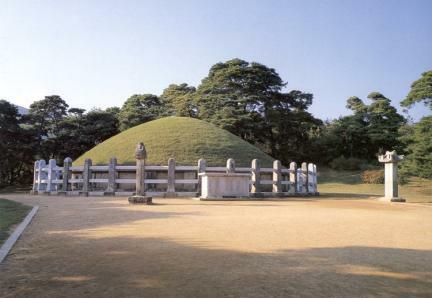 The diameter of the tomb is about 30m, and its base is strengthened by stone panels. 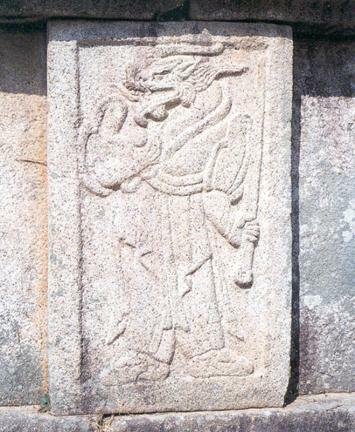 In between the stone panels, adorning the retaining wall, are relief carvings of the 12 Oriental zodiac images dressed in civilian clothes and with weapons ready as the unique tradition of Silla tombs since the royal tomb of King Seongdeok. Stone railings surround this tomb. 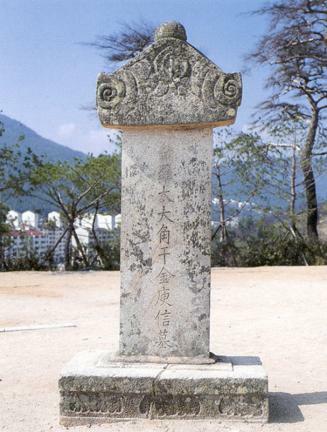 According to Samguk sagi (History of the Three Kingdoms), General Kim was honored with the highest government office of Taedaegakgan; King Heungdeok, the 42nd king of Silla, posthumously made him the Great King Heungmu. Thus, his tomb was prepared and cared for as a royal tomb.